The Master of Arts in English is designed for students seeking continuing education, a foundation for doctoral work (PhD, EdD, JD) and/or a credential qualifying them to teach literature and composition courses at junior and community colleges. Full-time students complete the degree in two years. All graduate classes are offered in the late afternoon or evening. A wide range of small seminars in literature, rhetoric and composition, cultural studies and digital humanities. Literary events that bring national/international authors to campus and literature to life. Graduate Teaching Assistantships and innovative Graduate Assistantships for select students in the second year of study. Flexible scheduling with classes offered in late afternoon and evening and part-time options. Welcoming to in-service teachers seeking additional credentials as well as students interested in building a foundation for doctoral work or law school. Our MA alums find employment in the fields of teaching, marketing and publishing and have gone on to pursue the PhD. The culmination of each MA student's degree program is a thesis project in literature or rhetoric. For further information on degree prerequisites, admission requirements and a list of courses view the Graduate Course Catalog. Official transcripts from ALL degree-granting (bachelor’s or master’s degrees) colleges and universities attended. An official transcript submitted in a sealed envelope which you have received from your college or university is acceptable. An essay expressing your reasons for wanting to join the particular academic program to which you are applying. What are your personal and career goals, and how will this particular degree from Chapman University help you reach those goals? Your essay should be double spaced, size 12 font, and 1-2 pages in length. Two letters of recommendation that speak to your academic preparation, intellectual ability and aptitude for graduate study. A finished critical literary essay of 12-15 text pages that demonstrates your talent for scholarly writing and ability to handle texts of literary criticism relative to the subject matter. The essay should reflect a grasp of critical literary skills and ability to deal with theoretical texts in an effective and knowledgeable manner. The MA essay must be a critical literary essay only. In other words, the subject matter should deal with literary texts and literary topics only unless it is a Comparative Literature paper. The dual degree combines the MFA in Creative Writing and the MA in English. 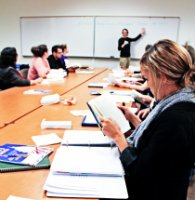 The dual degree combines the practice and study of creative writing with literary scholarship. It is designed for students who intend to pursue a career in teaching English and creative writing at the university, community college or secondary-school level. Dual degree students must be admitted to both the MA and MFA degree programs, be enrolled concurrently in both programs and complete all requirements for each degree program, including the book-length thesis for the creative writing program and a 6,000-10,000 word thesis for the English program. For further information on degree prerequisites, admission requirements and a list of courses, view the Graduate Course Catalog. In addition to application materials required for the MA, dual-degree applicants must submit a non-returnable portfolio of creative work that represents style and potential; this portfolio should include 20-30 pages of fiction or non-fiction, 10-15 pages of poetry, or the first 15 pages of a screenplay or stage play. Students already enrolled in either the MA or the MF. program who wish to switch to the dual-degree program must apply and be admitted to the other degree program before completing 27 credits. Apply now using the Online Application. Submit your application and all supporting documents by the deadline listed below. Applications received after these deadlines will be considered on a rolling basis as space is available. You’ll be able to complete both your bachelor’s and master’s degree in just five years: 4 years of undergraduate study and 1 year of graduate work. Must be an undergraduate student with 90+ units of undergraduate coursework completed, and a cumulative GPA of 3.0+. Apply during your junior year or first semester of your senior year. As a current Chapman student, applying to an accelerated Masters degree program, the department has agreed to waive the recommendation letter requirement for your application. In the online application, please enter the name, email and phone number for two faculty or staff members at Chapman who support you as a candidate for this program.